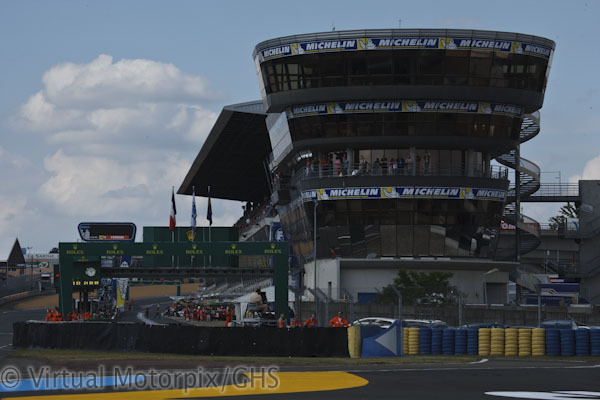 The 82nd Le Mans 24H 2014 endurance race has had one of the most eventful weeks in the lead up to the race on Saturday. Starting on Wednesday in the first free practice session, the #1 Audi R18 e-tron quattro had a massive ‘off’ in the infamous Porsche curves. 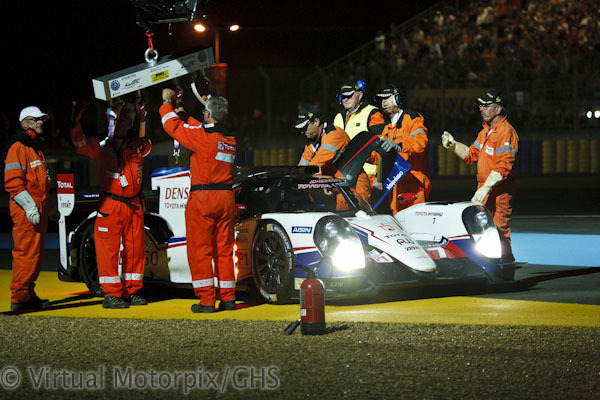 Fortunately Loic Duval got out of the car shaken but apparently unstirred, as first reports were that the badly damaged car plus its driver would be ready to hit the track again on Thursday morning. Alas, the car was on the track again the following day, but without Duval, his place being taken by Marc Gene. The medical team disallowed him from racing this weekend. The weather throughout the week has been fantastically hot, humid and dry to date, but light rain and cloud are forecast for tomorrow. The Wednesday night free practice session saw the #7 Toyota come to a standstill, just before the Dunlop Bridge at around 23h30. The reason, it was said, was a lack of engine oil pressure. It took a platoon of marshalls around 15min to remove the stricken vehicle a distance of 20-30 yards inspite of having the giant Manitou mobile lifting crane at their disposal. 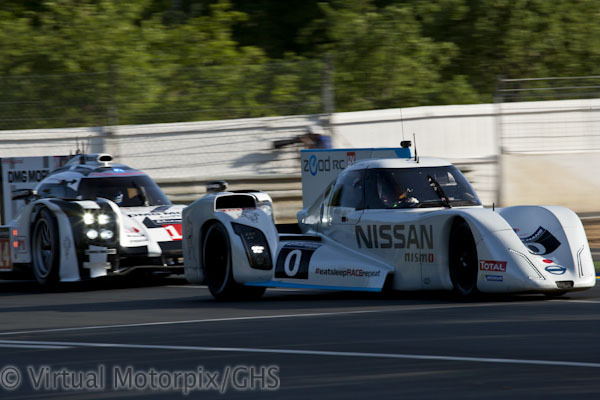 The eagerly awaited Nissan Zeod made its appearance on Wednesday afternoon, completing less than a single lap before becoming stranded out on the track. In the evening session the Zeod made another brief appearance completing only part of a lap once again. 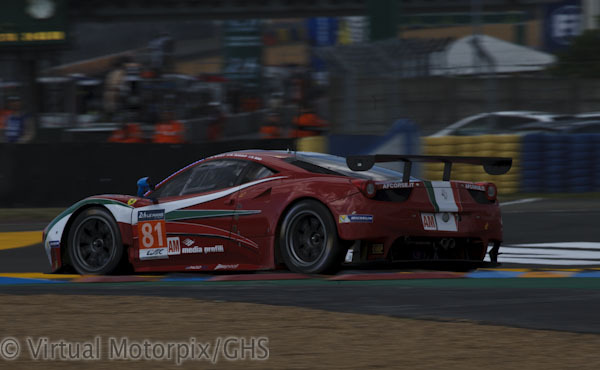 It faired somewhat better on Thursday during the two Qualifying Practice sessions putting in a best lap of 3:50.402, slotting in neatly between the LM P2 and GTE Pro runners. The Porsche Curves proved to be troublesome yet again on Thursday when no fewer than five GTE cars piled into the barriers in a matter of minutes. The #1 Audi which was back on track after its complete makeover, slammed into the outside wall at Indianapolis, leaving debris behind while making its way slowly back to the pits. En route back to the pits, an LM P2 car while trying to avoid the slow moving Audi, took to the grass and crashed at – you guessed it – the Porsche Curves. No doubt these curves will have more controversy to contribute to the story as the race unfolds over the weekend. Fernando Rees, driver of the #99 Aston Martin GTE PRO car is reportedly fine after his accident on Wednesday in which the car was damaged beyond repair and as a result was withdrawn. 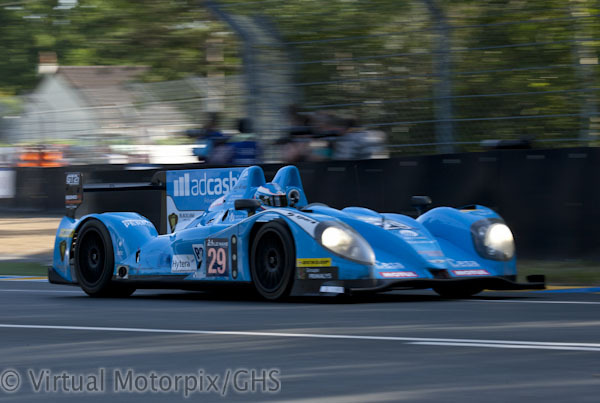 On a lighter note, the youngest driver ever to take to the circuit at Le Mans is 16 year old American Mac McMurry in the #42 LM P2 Caterham Zytek Nissan. 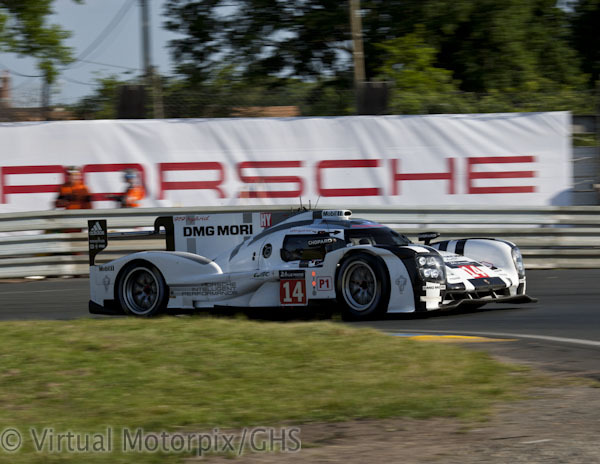 You might have wondered why Porsche chose the numbers #20 and #14 for their cars, which is of course 2014, the year in which Porsche returned to Le Mans. 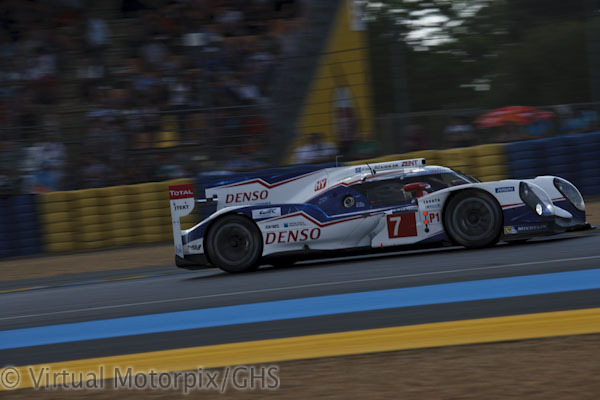 The long and short of all this frantic action in the manufacturers’ stakes has been that Toyota #7 will be on pole for the race on tomorrow, followed by the #14 Porsche and Toyota #8 in third. 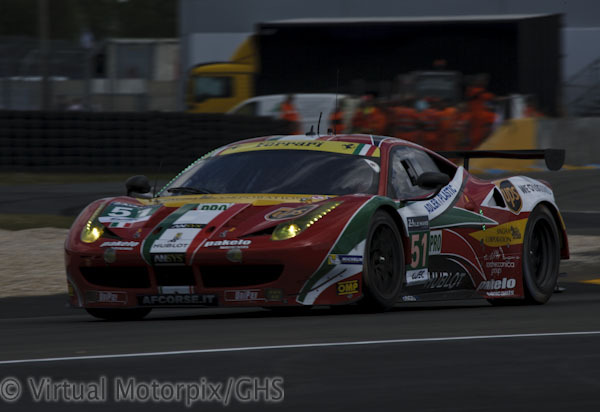 In the GTE Pro Class, the #51 Ferrari takes the top spot with the #73 Corvette in second and the #97 Aston Martin in third. At 23h15 on Thursday night, AF Corse announced that Ferrari driver James Calado had been withdrawn following his accident earlier in the day. His place is to be taken by Pierre Kaffer. One thing is for certain, the 82nd running of this famous race is set to provide spectacular viewing. With such tight racing in all classes, this race will keep you on the edge of your seat – for 24 hours. Just so that you know that you will be in good company, the Le Mans 24H will be shown in 190 countries to a potential audience of more than 802 million television viewers. Again a valuable insider view. Am looking forward to your account of the 24-h on the 14/15 June weekend.